This past weekend my wife and I had a wonderful, relaxing trip to Banff National Park in Alberta, Canada. We spent two and a half days exploring the park, a length of time that is far too short (we have already talked about returning!). When I booked the trip, I was mainly just finding an excuse to use my newly acquired Fairmont free nights and various certificates (SEE: We’re going to Banff!!). But once the flights and hotel were locked in, the hard part was over. The easy part would be enjoying the spectacular park. One of the biggest highlights for us was hiking Tunnel Mountain. Tunnel Mountain is the most popular hike in Banff, mainly by virtue of how easy and short it is. There is a ton of great hiking in the park. But since we were visiting in shoulder season, much of it wasn’t accessible yet. Make sure you know what you’re getting into if you are *not* visiting Banff in the prime summer months! Rather than search for other reasonable April hikes, my wife and I decided to climb Tunnel Mountain. We parked as far up the access road as we could. There were actually barricades blocking the road a couple hundred meters before a small parking lot (they close it in winter), so we parked right up against them. The climb is moderate and steady. My wife and I started it at a reasonable pace, stopping every once in a while, both to catch our breath and take some photos of the picturesque valley below us. The views kept getting better than better the higher we climbed. We stopped at several points along the upper part of the mountain to take photos. The views of Mount Rundle are spectacular. As is the view of the view of the Bow River Valley. It took us just under an hour to reach the summit. There were quite a few people enjoying the view of the Banff townsite when we arrived. The summit greeted us with signs congratulating us on our achievement, although they were several meters from the *actual* highest point of Tunnel Mountain. I would have gone and stood on the very top, if the spot wasn’t already occupied already by a guy busy staring at his phone. The views were amazing. The official Banff town website says Tunnel Mountain boasts 360° views. I can’t quite get behind that assertion. You have to kinda take them in piecemeal. It’s also hard to get a good view of Cascade Mountain. But the views are still wonderful on the whole. 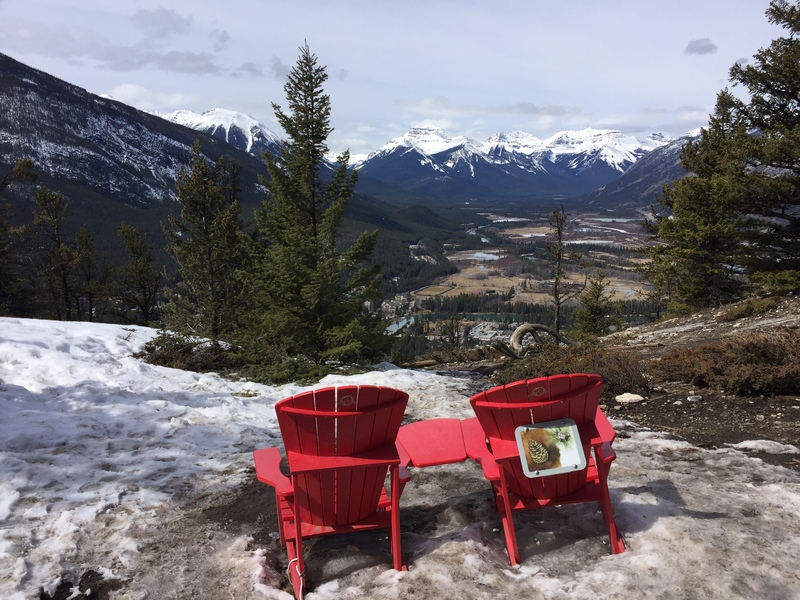 The summit also boasts the iconic pair of Parks Canada red adirondack chairs. If you’re unaware, these are a part of a social media marketing campaign launched in 2014/2015. You can find them at the Norquay viewpoint as well. The hike down was easy. We hardly stopped. We finished the 1.8 km in about 20 minutes. Our reward for our endeavor? Lunch at the Fairmont Banff Springs, cooked ourselves. I’m way too cheap to pay the kind of prices the Fairmont requires for their luncheon. Plus, our suite gave us great views of what we’d just climbed. Would I hike Tunnel Mountain in summer? Probably not, although not because it wouldn’t provide the same spectacular views. The number of people would turn me off. When my wife and I hiked the mountain a few days ago, there were a moderate number of people on the trail (based on what I am used to). As we were descending, we could tell that the trail was getting busier. We finished our hike just after noon. I’m glad we didn’t wait until later. In summer I would expect a *ton* more people on the trail, and it would probably reduce the enjoyment of the experience. If we visited in summer, I would look for longer and/or less frequented hikes. We hope to return again in the shoulder season of September, both for better weather and to avoid the peak summer crowds. I doubt it will be this September, though. Hiking Tunnel Mountain in Banff was one of the highlights of our shoulder season trip to the national park. We also paid Lake Louise a visit (of course) and drove up to the viewpoint on Norquay. If you are considering visiting Banff this summer, be aware that the park is free (SEE: I just got my free Parks Canada pass). One of the Fairmont staff explained to us that they are expecting the park to be even busier than usual. Exhibit A on how “free” can have its downsides. Whenever you visit Banff, make sure you don’t miss hiking Tunnel Mountain! Banff is absolutely stunning. Did you get a chance to make it up to Lake Louise? When you get a chance to spend more time up there, the views while driving from Banff on the Bow Valley Parkway and then the Icefields Parkway up to Jasper are incredible. I’ve been up there a couple times and will be heading back to Jasper this August. Hope to do some backcountry hiking while we’re there! Which credit card offers rewards for Fairmont Hotels?